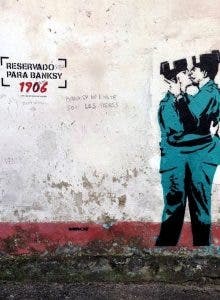 Home Other News La Cultura Is this the first Banksy in Spain? Is this the first Banksy in Spain? RESIDENTS of a small town in Spain have woken up to what they believe is the country’s first Banksy. The wall in Ferrol de Coruña, Galicia, has received the graffiti treatment in the style of the British artist in a space that has been reserved for him for years. The piece shows two Guardia Civil officers kissing and appears to have been signed off by the world famous enigma, whose work sells for millions of euros at auction. It comes after the Meninas de Canido initiative, sponsored by Estrella beer, was launched several years ago, pleading for Banksy to use their walls for a new piece. The spot, by number 23 on calle Muiño de Vento, was reserved for the British artist as part of a regeneration plan for the neighbourhood which began eight years ago. Last September 35,000 people attended the eighth edition of its urban art festival. If confirmed by Banksy, it would be the first of its kind in Spain, after one found in San Sebastian was erased after not getting confirmation of its authorship. Guardia Civil seemed pleased to be part of the potential first Banksy in Spain. “Well it would be nice to be the protagonists of the first Banksy in Spain, don’t you think?”, it Tweeted to its 1.2 million followers.